Jinja has a vibrant downtown and broad leafy residential streets set next to the Nile River. Tourism has grown to compete with the manufacturing past of the town as nearby water sports draw visitors from all around. Here you can get your fix of kayaking, whitewater rafting, bungee jumping, horseback riding, and mountain biking. The stretch of rapids along the upper Nile near Jinja is considered one of the most spectacular places in Africa to go white-water rafting. Despite the intensity of some of the rapids (grade IV and V), most people who venture here are first-time rafters seeking an adrenaline rush as part of their tour in Uganda. Safety standards are impeccable; with all rafting trips accompanied by a fleet of rescue kayaks and a safety boar you can retreat to if you find things a bit too adventurous for your tastes. In addition to the standard big water runs, there are also less extreme options including a family float trip. more effortless experience can choose a tandem or sit-on-top kayak trip. Some prefer to take in the sights and sounds of the river at a more leisurely pace. Sunset and half-day cruises can be arranged with or without drinks and snacks included. A trip to the source of the Nile is another popular option. For those seeking a big motorised thrill on the Nile, an exhilarating 90 km/h speedboat trip over the rapids is definitely the preferred activity. The 30-minute trip (US$75 for adults) includes plenty of 360-degree spins, jumps and near misses. Quad biking along the beautiful banks of the Nile is a thrill you won’t soon forget. Trips ranging from one to 3.5 hours including visits to local villages can be organised though reputable providers who also giving lessons on their practice circuit. We can arrange a range of guided tours including visits to the villages between Bujagali Falls and Jinja, which can finish with a boat ride to the source of the Nile River. More intense trips through Mabira Forest Reserve and tailor-made trips can also be organised. When you’re in or near Jinja anyway you don’t want to miss the chance to ride horseback for a different perspective. A two- or three-hour ride on these great healthy horses is just one of those special experiences you will not soon forget. The views over the Nile are great and the people waving to you as you pass their local villages will surely bring a smile to your face. The horses are very well trained and maintained by their Australian owners. There are horses for riders of all experience levels. Uganda’s only bungee jump departs from a platform perched 44m over the waters of the Nile River. For those with the stomach, this will be an unforgettable experience. e mighty Nile Perch. We can now offer you the opportunity to pursue these fish on both water bodies. 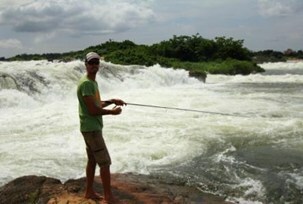 You can book from Jinja either full day, morning, or afternoon trips which cater for either the first-timers or the experienced anglers. Multi-day camping trips can also be organised. All fishing gear, camping equipment (if staying overnight), safety gear and drinking water is supplied. If you’d like an authentic Ugandan experience, we strongly recommend that you join one of our hiking and cycling tours through the village of Namwendwa just east of Jinja. During your visit, you will learn how to cook the local food (such as the banana mash known as “matoke”), brew your own Ugandan Gin (“waragi”), and of course meet the local people and experience how they live day-to-day. You can choose to either stay at a local homestead or camp on the farmer’s land. Our trained resident guides will accompany you and introduce you to the members of the community. All proceeds from the trip (approximately $30 per person) will go towards supporting the community’s milk production. This is a great opportunity to mix with local people and experience the true flavour of Uganda!